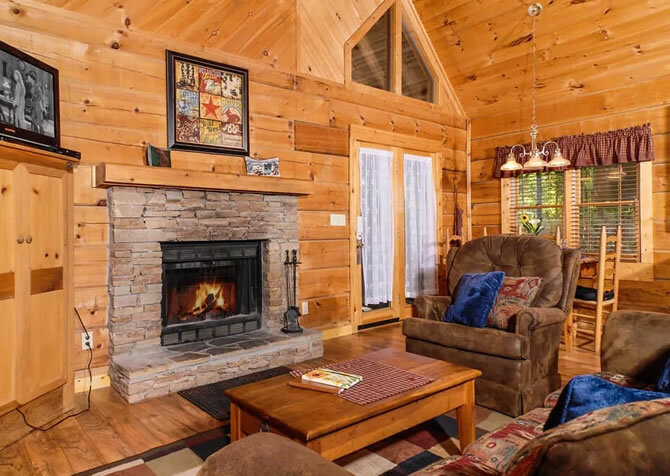 Family vacations, trips with friends, and romantic retreats in the Smokies just wouldn’t be the same without a relaxing cabin stay — and Auntie Sue’s Cabin comes with enticing extras sure to please! Enjoy tree-studded views all around, settle in for movie nights on the flatscreen TV in the inviting living room, prepare mouthwatering recipes in the fully equipped kitchen, keep up with your favorite dramas via the complimentary Wi-Fi, soak away your worries and cares in the steamy hot tub, and slip into the queen-size bed for a restful sleep every night. 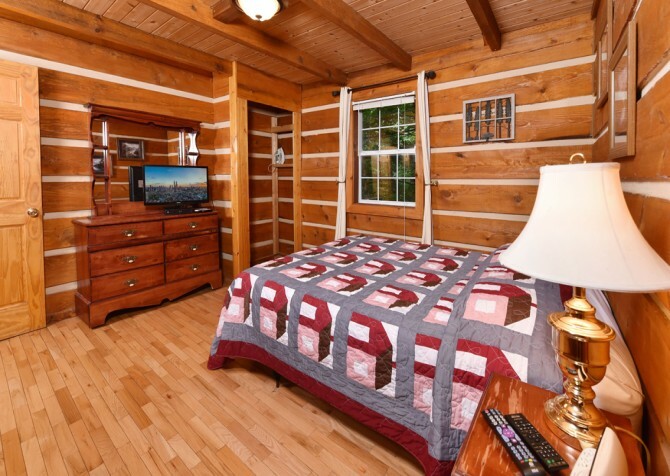 Situated between downtown Pigeon Forge and Gatlinburg, this 1-bedroom, 1-bathroom cabin for 5 not only offers a cozy place to unwind but also a convenient location well within reach of local eateries, country shops, top-notch attractions, and the Great Smoky Mountains National Park. 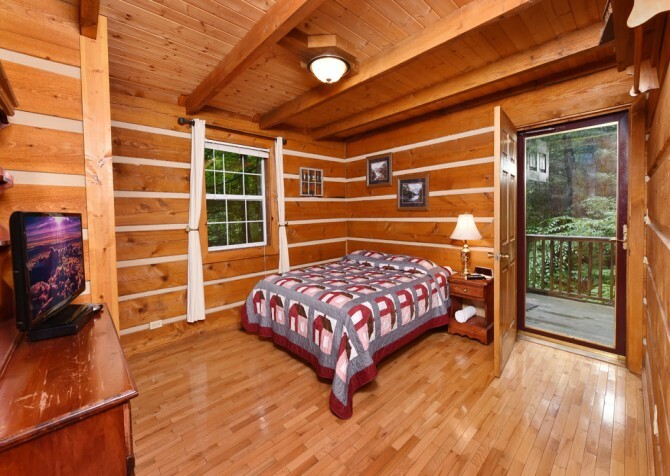 You’ve made it to your Smoky Mountain abode. All that’s left to do is step inside and explore the cabin, starting with the welcoming living area. 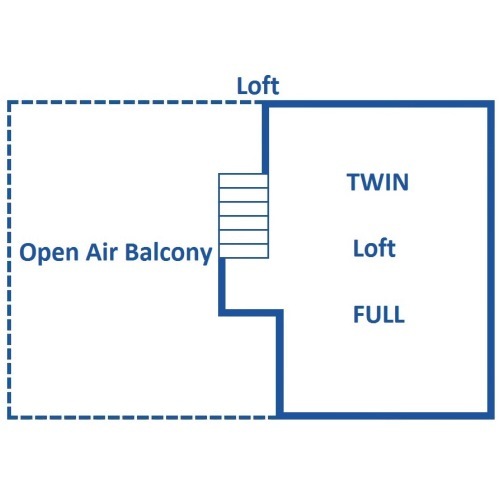 The high ceiling really opens the space, while the large windows bring lush treetop views indoors. Plop on the sofa or love seat, switch on the flatscreen TV, and pop in a DVD to kick off your vacation in style. Fancy a game of wits? Challenge your bestie to a round of chess on the coffee table or clear the space for a few card or board games from home. There’s also a plush recliner and floor lamp, perfect for an evening read. 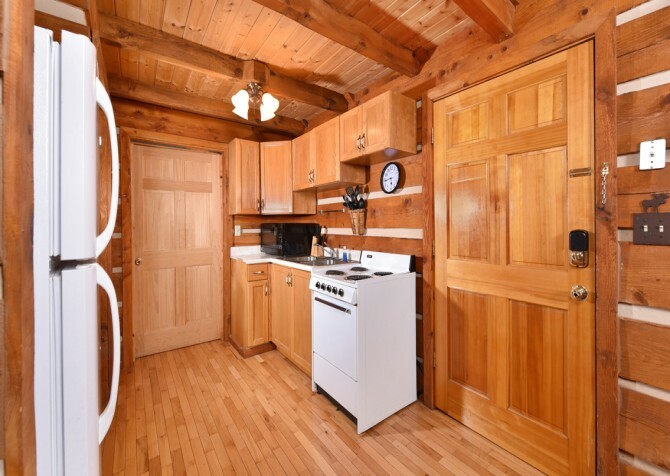 When you work up an appetite, you’ll love having a fully equipped kitchen mere steps away. All the essentials for preparing tasty dishes and scrumptious sides will be at your fingertips, including major appliances, pots and pans, cookware, dishware, silverware, and mugs. Cook a hot breakfast on the stove, whip up a sandwich spread for lunch, and reheat restaurant leftovers for dinner in the microwave. And don’t forget to stock the refrigerator with snacks and drinks so you won’t have to head into town when you have a late-night craving! 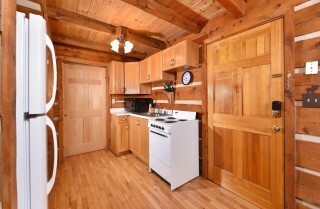 Near the kitchen lies a quaint dining area, with a round wooden table with 4 cushioned chairs for comfort. 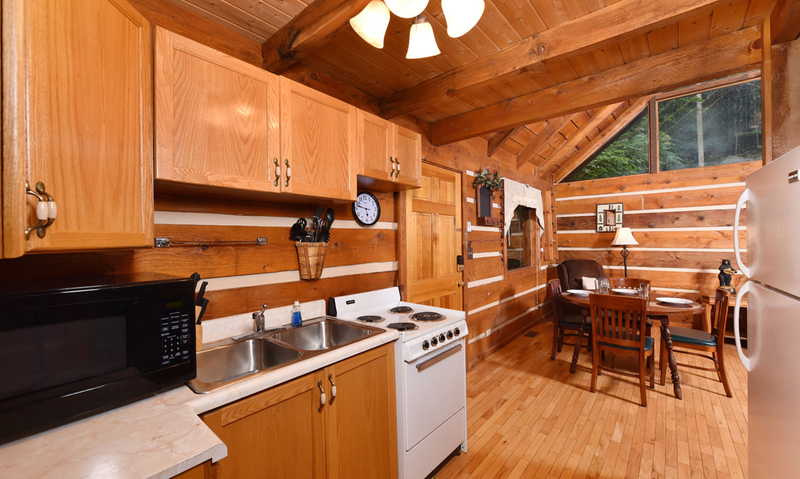 Skip the wait at restaurants and enjoy a romantic candlelit dinner or a family meal in the privacy of your own cabin in Pigeon Forge. This space is also useful for checking emails, enjoying magazines, planning trip excursions, playing games, and preparing arts and crafts for the kids. After the sun has set and everyone’s ready to hit the hay, get some quality rest in the spacious bedroom’s queen-size bed. Too excited from your downtown adventures to sleep? 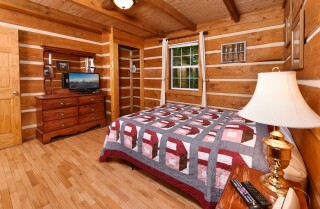 Flip on the bedside lamp, pop on the flatscreen TV, and enjoy a bit of entertainment before dozing off. 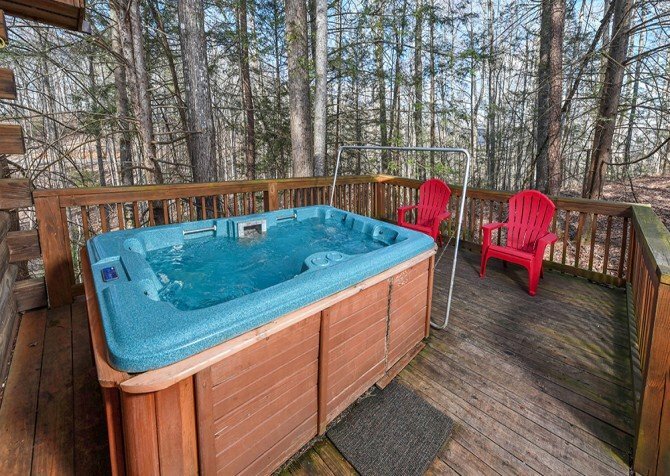 You’ll also have direct deck access from the bedroom, meaning fresh Smoky Mountain air and midnight hot tub soaks are never far away. 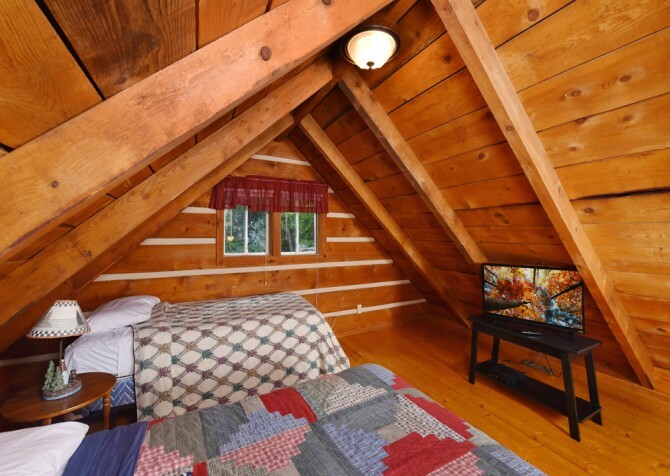 If you have kiddos or additional guests, the loft with a full-size and twin bed will provide extra sleeping space, complete with a flatscreen TV and DVD player. 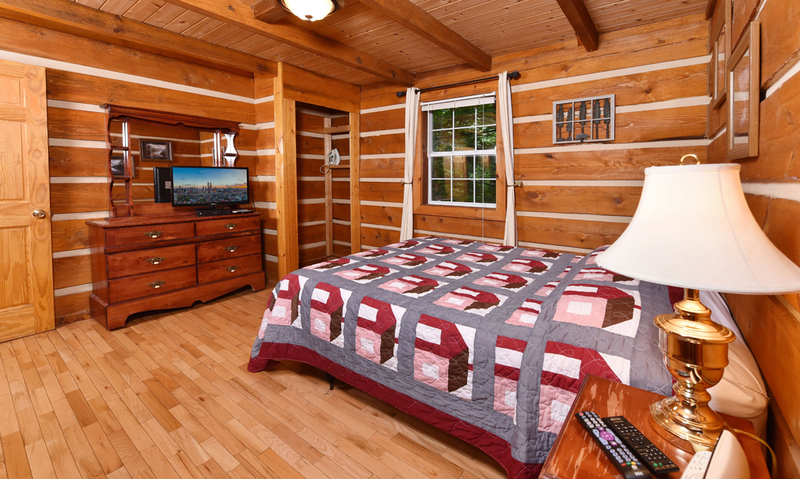 After a full day of fun in town, head back to your charming log cabin, up the steep driveway to a paved parking area for up to 3 vehicles. Grab your shopping haul and walk only 3 steps up to the home. After unloading your Smoky Mountain goodies, head back outside, where tranquil wooded scenery awaits. 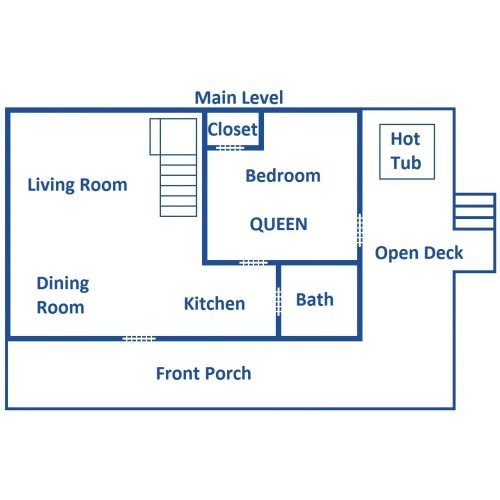 Sit back in the chairs on the porch with a cup of coffee or soothe tired muscles with a soak in the bubbly hot tub on the back deck. There’s even a charcoal grill, awesome for barbecue shindigs and steak dinners. What else does Auntie Sue’s Cabin have to offer? Why, free wireless internet of course – meaning posting trip photos, streaming TV shows, browsing local deals, and checking out the Cabins for YOU blog will be a breeze. And for those looking to bring back a few childhood memories, a classic VCR is ready and waiting. 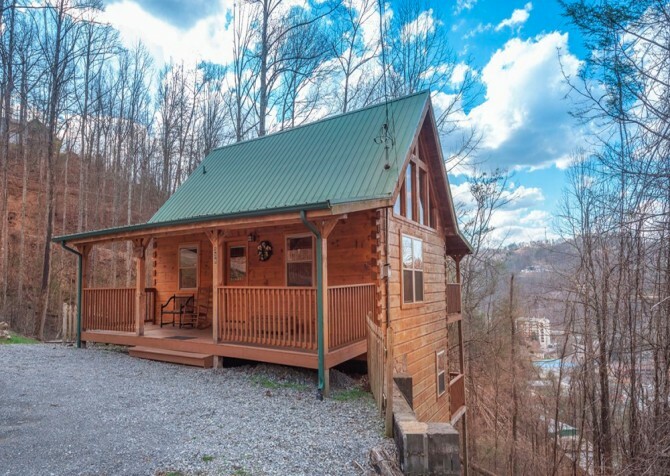 Located just 4.9 miles from downtown Pigeon Forge and 6.2 miles from Gatlinburg, this Pigeon Forge cabin rental is perfect for those wanting to see what both towns have to offer. Ideal for families, Pigeon Forge is home to dozens of family-friendly attractions and dinner shows. Dollywood and Dollywood’s Splash Country will be an entire day of fun, while WonderWorks, the Titanic Museum Attraction, and the Hollywood Wax Museum will entertain and amaze both children and adults. Along the Parkway, find laser tag, arcades, miniature golf courses, go kart tracks, and more! Pigeon Forge is also known for its many shopping opportunities, with local stores and outlets in rich supply. Nearby Gatlinburg also offers plenty to do! Downtown has an exciting nightlife, and the many snack shops, restaurants, stores, and attractions along the main strip are easy to browse and explore as you stroll along. Of course, the Great Smoky Mountains National Park is Gatlinburg’s most famous attraction, with more than 800 miles of trails for hiking, biking, picnicking, horseback riding, and more! Race family and friends at The Track Smoky Mountains, featuring not only 4 go-kart rides but also a carrousel, bumper boats, and an arcade. Dine like Southern royalty as you watch one of the most popular dinner shows around — Dolly Parton’s Stampede! Want to skydive…but not too keen on dangerous heights? Check out Flyaway Indoor Skydiving, where you can soar safely inside a wind tunnel! "Our experience was great. We stayed at Auntie Sue's cabin for 3 days. 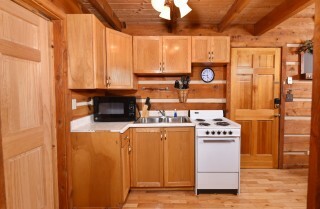 The kitchen had all of the pots, pans, and utensils that I needed, it was very clean and cozy, close to Gatlinburg and Pigeon Forge, peaceful, and perfect for just the two of us. This was a weekend getaway without the kids. There's a loft upstairs with two beds and a TV, which would be perfect if we bring the kids next time we come. 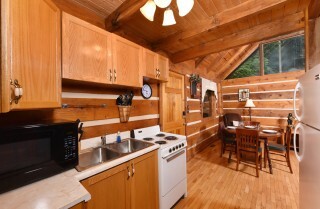 We've pretty much decided that we're going to book this cabin every…"
"Our experience was great. We stayed at Auntie Sue's cabin for 3 days. The kitchen had all of the pots, pans, and utensils that I needed, it was very clean and cozy, close to Gatlinburg and Pigeon Forge, peaceful, and perfect for just the two of us. This was a weekend getaway without the kids. There's a loft upstairs with two beds and a TV, which would be perfect if we bring the kids next time we come. 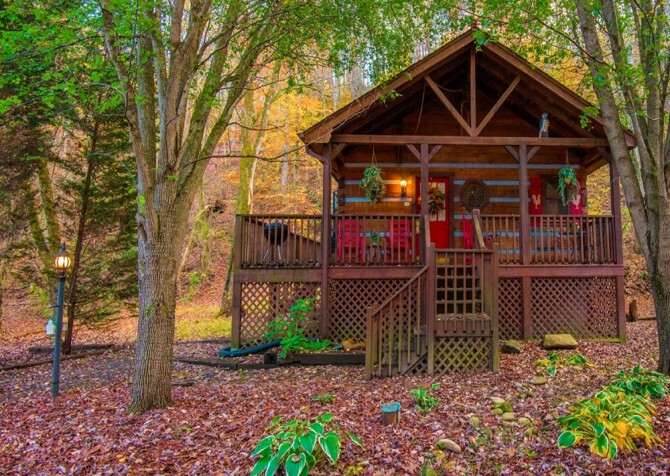 We've pretty much decided that we're going to book this cabin every time we want to go to Gatlinburg/Pigeon Forge and even talked about coming for Christmas one year. 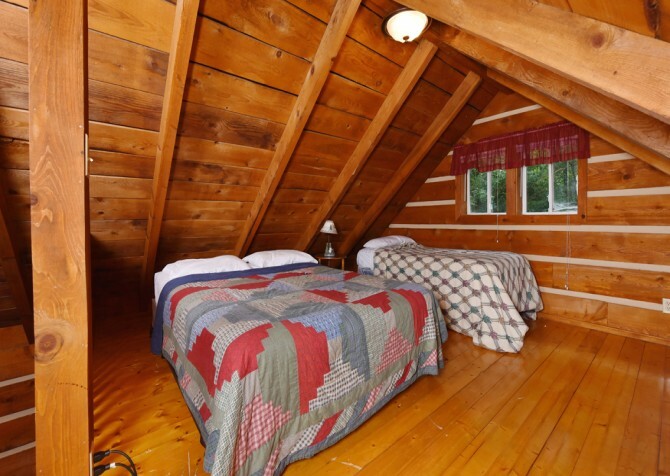 We loved our stay and definitely recommend Auntie Sue's cabin."